This little party is awaiting more guests - be careful! In charming little red diorama box sit three guests of the devil. A drinker, a convict and a lady of the evening accompany the devil in welcoming more partiers (a convict, a less than chaste lady and a fellow up to no good)! The background is red and glittery and WELCOME is printed in a primitive fashion on this small vignette's floor - just a great little reminder! 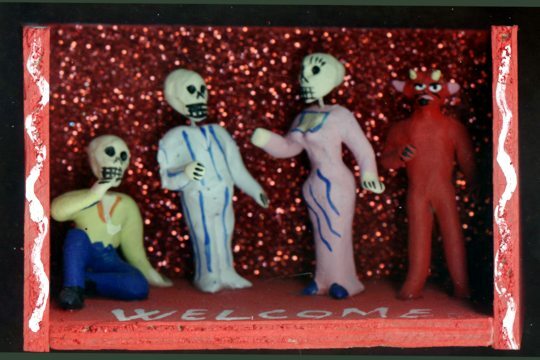 This special diorama is created almost like a shrine or nicho, with a hand-made Muerto figure in the background. It measures about 4 inches wide and about 2-3/4 inches high. All of our Day of the Dead figures are made by traditional artisans and are hand sculpted and painted by traditional Mexican artisans. Each is a bit different as they are all handmade! Please let SilverCrow choose one for you!